Oh, be still my heart. This episode really makes my day. We are seemingly led down a path thinking that it will go one way, but un-expectantly encounter another. Perhaps it is bittersweet for all parties, gaining a measure of happiness, but also going against a measure of time. Should we dive headfirst knowing that our hearts will break, or should we embrace whatever remaining time we have left? All’s I have to say is that with our recent turning of events, the romance is upped and with that, so will the angst. But I’m going to enjoy the well-earned peace, even if angst is only an arm length away! Aiko convenes with Keniji Sato at a secluded spot and he reminds her of her criminal demands to kidnap Seiko and sell off her body. He promises to safe keep the voice recorder so long as she plays nice with her “hubby.” Aiko declares that she’s NOT his wife, but never mind that, because her biggest concern is that he holds his end of the bargain and ensure Seiko is as good as dead. Onitsuka clan gathers to strategize the rescue mission, however the bodyguards report that Takeshi has once again escaped them. Ryu tears open the letter from Takeshi and realize he’s been outsmarted. Takeshi pens that he knew Ryu wouldn’t let him rescue Seiko and would ensure this by spiking the tea, so we see that Takeshi spits out the tea once they’ve carried him away to his room. Furthermore, the necklace that he has given to Seiko is akin to the promise to protect her, even at the expense of his own life. Thus, he will fight to the death to defend his beloved as well as the country from bad people like Keniji. Ryu folds the letter back with realization, maybe Takeshi is right, this is not only about matters of the heart, but this pertains to the livelihood of this town. Onitsuka clan declares to show Sato that evil does not win, if Onitsuka has anything to say about it! They adhere to the initial escape plan, this time around, in protection of Takeshi. Satoshi wonders if a ghost has possessed his sister because she’s in such a good mood. She even went shopping. The scariest thing she purchased is an engagement ring for herself, she’s convinced that if Seiko is out of the picture, Takeshi will surely marry her now. Takeshi arrives at Keniji’s turf, samurai sword in tow. I sure hope his plan is a little more fleshed out than walking into the tiger’s cave alone. Keniji relents that he’s quite touched by Onitsuka Sorel’s commitment to his love, while they reveal Seiko behind the door, clad in a kimono. She cries that Takeshi still showed up despite knowing that it’s moot. Well, not over Takeshi’s dead body. He demands to know what Keniji wants in exchange of Seiko’s freedom. Oh, just a game of cho-han (Japanese game using dice). The players would guess whether the dice would show even or odd. If Takeshi loses, he will give up his life. Takeshi remains fierce and stubborn under pressure. May the odds be ever in your favor.. Meanwhile his clan (thank goodness for them!) proceed with the rescue mission as planned, one crew ascertain the front and another from the back, while the third crew wait for further backup instructions. Ryu infiltrates from the inside, feigning as a customer and flirting with the escorts. Haro dresses up as a server. Takeshi requests to inspect the dice first and then they commence the game. He chooses even.. Keniji lifts the cup.. and it’s a count of 4! Even! Takeshi cuts the bind and embraces Seiko, who utters in disbelief (not to mention relief) that he hadn’t abandoned her. Takeshi assures her that he will never abandon the woman that he loves. Keniji tells the couple that Onitsuka’s love is quite touching, but he isn’t about to let his special guest go this easily. Takeshi orders him to release Seiko and they can settle this mano a mano. Keniji unsheathes his sword and strikes, but Takeshi defends with his sword. The two battle ferociously and Keniji slashes Takeshi a couple of times on the arms and side, causing Takeshi to fall to the ground. Just as Keniji raises his sword to stab Takeshi, Haro appears and knocks him to the ground. Yay backup! Keniji snipes that Takeshi is a coward and doesn’t dare come without backup, but Haro declares that they came on their own volition because they knew Keniji isn’t trustworthy. Downstairs, Ryu fires his gun and the crowd disperses with fright. The two clans open fire as Ryu sneaks upstairs to aid his cousin. Takeshi continues his onslaught against Keniji while Haro handles Sato’s minion. Skillfully Onitsuka take down Sato. Keniji (with a gun pointed at him by Koji) gripes that Onitsuka is dishonorable. Takeshi promises him not to worry, because he will surely kill him with his own hands, his clan are not to meddle. As Takeshi’s sword clashes against Keniji’s sword, he pinpoints all of Keniji’s wrongdoings: you killed my family! You’ve soiled this town with your illegal activities! And you disrespect the woman that I love! Slash! You will pay with your life! Slash! But Keniji’s minion blocks the final slash with his body and the cops arrive. Dammit. Keniji takes off, throwing his minion against Takeshi. The police chief learns that the two clans have slipped through their fingers again, and unfortunately none of the witnesses remember anything. His subordinate wonders if this has anything to do with Seiko’s kidnapping. Takeshi states that Seiko will be staying at Onitsuka’s domain from now on, no ifs ands or buts. He orders his bodyguards to collect her things at home. But Boss Lady is concerned and questions Seiko’s position at Onitsuka’s household. Takeshi declares that Seiko is his woman, thus her position will be Okusang, secondary wife. Onitsuka clan must honor her and protect her with their lives. Yikes! Before Seiko could balk at this, Auntie ushers her out. Koji surmises that Ichiro (the former Sorel) would not be happy with this decision. The other warriors concur because they don’t want to cause a rift with Misawa. It’s already difficult handling Sato, if Misawa decides to make themselves sworn enemies, the town will disintegrate. Ryu laments that the future of Onitsuka lies solely on Sorel’s decision. Takeshi eyes each of his warriors and announces that his decision is final: Seiko will stay at Onituska’s holding as Okusang and he will be responsible for the backlashes. He pulls her close and promises not to touch her (you know, in the other way..) and that they could just live together. She peers at him closely as he says, “You’ll be my Okusang only in name, by the time you return to Thailand, your parents are none the wiser.” He sees her smile, “Your smiles always brighten my heart. It’s late now; I’m going to take my Princess to bed.” Oh my, why is that hot? Takeshi! Mario! He tucks her in bed, “You’re no longer my sweet dreams. From now on, you’re my daily dosage of happiness.” Eeee! Unable to sleep due to the recent turning of events, Haro gets up. His father approaches him and warns him that he has no right even to think about Okusang. Their role is to protect Sorel and his woman, so he can’t allow his feelings to meddle with his responsibility. This is an order! Poor puppy, you know you never had a chance in the first place. Takeshi notices that his Okusang is stirring in bed, and surmises that she’s unable to sleep due to the unfamiliar surroundings. Methinks NO ONE can sleep with Mr. Hot Takeshi an arm’s reach away, just saying. He admits that he’s so happy that he doesn’t want the night to fade away. Seiko brings up a curiosity about the cho han game earlier. She wonders why he had to inspect the dice. Takeshi replies that his father once told him that one can rig the outcome of the dice by the size of them. Since Keniji isn’t a man of honor, Takeshi wants to test out the theory. Seiko admits that she was afraid he would guess incorrectly, and Takeshi relents that it doesn’t matter whether he wins or loses because Keniji wouldn’t let them go. Seiko bristles, “You knew there wasn’t any way out, and yet you still came,” that’s what I’m saying. “I chose the pairing (even) number because I know that if we were to survive, we will survive together. And if we die, we will die together,” he utters. “The full year that I get to spend with you before you graduate – it’s the most valuable thing you can give me.” Aw. He reaches over to grasp her hand – in spite of his searing pain – and tells her that in the timeframe that he hasn’t married Aiko, it’s her responsibility to play the role of Okusang and come out to the society events with him. He explains that first and foremost, he would call her “Kimi” meaning a woman that he dotes on and she would give her husband the name of “Anatak”. Seiko tests out the words on her mouth and smiles. Takeshi wishes goodnight to his beloved Kimi and kisses her hand. The two sneak looks at each other’s back until she whispers softly, ‘good night Anatak, my beloved.’ Damn. Someone please slap the smile off my face! Next rule of business is to help Takeshi get ready in the morning. There’s something intimate in helping “your” man with his attire. Takeshi is enjoying it thoroughly as he watches Seiko fix his tie, button up his vest. He pulls her in for a hug and wonders why she’s not used to it by now since he’s always hugging her. She relents that it disconcerts her but she doesn’t know what to say. He suggests that she simply say that she loves him. Heh. Takeshi leans in for a kiss but only to get interrupted by Ryu. Worse timing ever! Ryu claims that he normally enters this room everyday (meaning it’s not unusual that he’s here.) Takeshi admonishes Ryu to adjust himself and shuts the door in his face. Ryu snipes that Takeshi will just have to wait and see what happens when HE gets a wife. Ha. Ryu is surprised by what he just said and chides himself for actually speaking out loud what he really thinks. Hee. Haro takes his anger out on the practicing mannequin, relinquishing his memories and thoughts of Seiko. Seiko wanders the confines of Onitsuka’s holding, admiring the large establishment. She spots the guards on all corners of the house. “Make yourself at home,” Takeshi advises as he approaches her at the pond. “You’ll get used to it.” He’s referring to the security guards around the perimeter. He has arranged for her things to be placed in his room, which raises her concern that everyone knows she’s his secondary wife now. She explains that her culture doesn’t condone stealing another woman’s man. Takeshi counters that he is willing and he loves her with all of his heart. The next responsibility on the list is to learn the Japanese culture. Seiko has a tutor assigned to all aspect of being Okusang: especially understanding how to change clothes and wash each other’s back during baths. ROFL. Had to laugh about the second most important thing.. The lovebirds quite disgust Ryu who proclaims that they are so full on love that they don’t even need to eat. Heh. But the sweet moment is short lived as Aiko comes storming in and calling Seiko shameless. She marches forward and slaps Seiko. Takeshi literally removes Aiko from choking Seiko and orders Haro to protect Okusang. Aiko remembers the one thing that Takeshi utters (Okusang), and she shouts vehemently that she forbids it. Daddy Misawa appears and chides Takeshi that it’s impolite to keep a woman in his holding. The two Sorels have a private chat as Misawa brings up the fact that Takeshi wants to avenge his family then marry, but now he has a mistress! Takeshi laments that she’s his Okusang and the first wife role is still reserved for Aiko. Which doesn’t console Daddy dearest at the least, he thinks the right thing to do – if he wants to protect Seiko from Keniji – is he ought to send her back to Thailand. Takeshi argues that he will – in a year’s time, when she’s finished with her schooling. He promises not to have any more Okusangs after this. Koji and Ryu remind Misawa that it’s a win-win for him in this situation. Now that they’ve chased Keniji out of business, the clubbing business will only fall onto Misawa’s lap. There’s nothing like some financial gain that will entice a man to drop his squabbles. Seiko cries alone in the courtyard. Haro consoles her with his handkerchief and a bundle of ice to cool her face. She tells him that she’s a bad woman, stealing another woman’s fiancé. He assures her that Sorel won’t let anyone harass her. As they watch Misawa leave, Onituska clan remind themselves that they have to take extra precaution; Ricki is the type who would change course if push comes to shove. They have to prepare themselves against Keniji and Misawa now. Ryu prompts Takeshi to see how his sweetheart is holding up, yesterday she was kidnapped and today she was slapped. Seiko says that she can no longer use the icy bundle to compress her face since her fingers feel frozen. Haro suggests that he do the honor. Seiko relents that they must be suited for this since he has helped her on several occasions before. He promises to take care of Okusang with his life. And this is the scene Takeshi witnesses. Ha, let’s stir that jealousy pot! Takeshi apologizes to Haro for asking him to watch over Seiko, but Haro immediately says that it’s his duty. Takeshi tenderly takes his Okusang away, killing Haro inside. In their bedroom, Takeshi asks if she’s still hurting. Seiko admonishes that she deserves to be treated this way, after all, Aiko is already displeased that Seiko is involved with Takeshi, now that she’s his Okusang, Aiko’s heart must be torn in a million pieces. Takeshi caresses her cheek and replies that Aiko has gone too far. But Seiko argues that no woman can accept it when her man has another. Takeshi counters that he’s not engaged yet and he’s no one’s man. Seiko refutes that they both know the truth, regardless; she will try to avoid Aiko. Once she goes back to Thailand, everything will end on its own. With that, Takeshi pulls her into his arms and apologizes; his love is the root of the pain and suffering for her and his clan. Is he that selfish? Even though she tells him not to blame himself, and that no one wants it to turn out this way, Takeshi cannot shake off the guilt he feels inside. Ricki and Satoshi literally drag Aiko home kicking and screaming. It pains Daddy to see his dearest like this because the situation mirrors his own situation many years ago when he and Ichiro fell in love with the same woman. He had been trying to tell Ichiro that he will ask for her hand in marriage, but Aideko beat him to the punch and showed up – Ricki gave her the birthday present, which was an engagement ring. Awkwardness ensued because Aideko had already agreed to marry Ichiro. Ouch. Present day, Ricki never got over the pain. Satoshi questions his father on why they are allowing this, but Ricki says they can’t go against Onitsuka. He doesn’t want further embarrassment from his children, the girl has no mannerism, while the son isn’t fit to be Sorel. He orders his son NOT to settle this with Onitsuka. But when his son stomps away, he tells his lackey that he’ll allow Takeshi to relax a bit. When the time is right, he will strike. Aiko simmers in anger, with mascara streaming down her face, she vows to do everything in her power to thwart the happiness between Takeshi and Seiko. Oh, I believe you. Her brother’s hatred towards Takeshi climbs and he orders his minion to do something for him..
Onitsuka prepares a small party to welcome Okusang officially to their clan. Ryu asks Koji on what types of guests are invited to such party, you know, he’s just curious and all. Koji surmises that maybe he’s interested in inviting a certain someone. Heh. But Koji has already taken the initiative to invite Mayumi since she’s considered a close “family” member, unfortunately she’s unable to make it due to finals. Ryu mutters to himself that her finals’ not until two weeks’ time, can’t she stop by for 2-3 hours? He is cracking me up! Koji suggests he ask Mayumi himself. Heh. And he takes off. Auntie surmises that Ryu is still tight lipped about his feelings for Mayumi, but Koji infers that Ryu is probably unaware of his own feelings. Mayumi balks at the idea of a woman who steals another woman’s fiancé. Especially when the whole world knows that Aiko is to marry Takeshi. Mom counters that maybe the man is smitten himself, and besides, Aiko isn’t the nicest person on the planet. Regardless, Mayumi thinks that Seiko is worse than Aiko. Ha, boy is she in for a rude awakening. Mom doesn’t want to argue and tells Mayumi that if she doesn’t want to go to the party, she ought to tell Ryu herself. Mayumi is surprised to hear that all this time, Ryu is waiting for her answer in the living room! She rushes to fix her hair and meet him. So cute. “You’re so young, yet you’re experiencing Alzheimer already, my beautiful fiancé?” Ryu laments. Mayumi argues that their engagement will be nulled. But Ryu begs to differ, HE hasn’t agreed to null it. 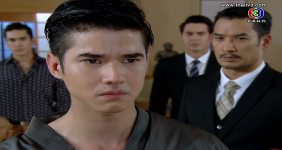 Mayumi sulks that he told OTHER people that he was forced to tie the knots with her. “Oh, that’s what you’re pouting about?” hehehe. Ryu contemplates how a man would reconcile with his woman these days. Then, he raises his hand above her head and procures a flower necklace. It dangles before her. “There’s only two of us, who else is it for?” he says sarcastically. Mayumi is startled and caught completely off guard by his sweetness. We know she finds him to be quite handsome and unsure of how he would receive one who is as “normal” looking as she – I mean, however normal a beautiful angel from above could look like, I GUESS. He replies, “Let’s set aside the reconciliation part – because this necklace isn’t for that purpose. This is a good luck token for your finals, daisy represents hope and good fortune. Since you’re not going to the party, wear this while studying your finals.” Aw, Ryu. Why are you so cute?! Onitsuka clan welcomes their Okusang, but all shrewd eyes are on her during dinner. Takeshi reaches over to help her with the fish, but she stops him, indicating that even though in her culture it’s okay to share the same plate, but in his, it’s frowned upon and she doesn’t want to shame him. Takeshi smiles at her consideration, while the rest of the clan watch on with an approving smile. Koji notices that his son is upset and watches him excuse himself from the dining hall. The warriors compliment that Okusang is a great representation of the clan; her mannerism and character are above reproach. She’s accepted with open arms! Bath time! Seiko learns the tradition of preparing baths. She knows exactly what temperature to set for Sorel. The use of the tub is followed by Ryu, than her, unless she wishes to bathe with Sorel. Heh. Auntie hands her the nightwear that Sorel would adorn after the bath, and Seiko wonders (albeit reluctantly) where Sorel’s undergarments are. Auntie informs Seiko that Sorel does not wear under garments to bed, did she not notice that last night? Hehehe. Takeshi appears, not sure if that’s any consolation for Seiko’s flushed face. He informs her that the clan has accepted her wholeheartedly. He invites her to take a bath with him because the doc advises that he shouldn’t get his wound wet, and he has wounds EVERYWHERE. Seiko relents that she will bathe after Ryu and that if his wounds are everywhere, he shouldn’t bathe then. But he’s going to stink and she’s going to bear the brunt of it because she sleeps next to him. Seiko replies that she would rather die.. and Takeshi wonders if he has to be close to death before she would be willing to take care of him. Finally, Takeshi just pouts because he can’t guilt her into taking a bath with him. He struck a nerve though; Seiko stands there and peers at him with guilt. Takeshi smiles with satisfaction when she follows him to the hot tub. She thinks that he’s going to strip naked but he still has on his underwear. Takeshi relents that next time, he won’t tease her and will just take it ALL off. Heh. Furthermore, he wasn’t kidding about his wounds, Takeshi turns around to show her the cuts and bruises on his back. As he settles in the tub, Seiko washes his back. Later she helps him into his kimono nightgown, slipping her arms around him to tuck the belt. So cute. Seiko tells him to head back to the bedroom while she bathes, but he mentions that Ryu might misunderstand and thinks it’s his turn to bathe. There’s also no lock in the room. He will wait for her in the adjacent changing room (which is only blocked off by a curtain of beads!) while she bathes so they can head back to bed together. He promises to turn his back and not sneak a peek. Ryu spies that they are back in their room and immediately open his door to tease his cousin. “So you’ve only rushed back to wash each other’s back.” He feigns as his cousin, “My dear Kimi, you’ve washed it well?” LOL, he even kisses the door. Takeshi wonders why it bothers his cousin so, but Ryu relents that it annoys the crap out of him. Just he wait and see, once Ryu has his own Okusang, then he’s going to claim the bath place, the kitchen, everything. Hehehe. Takeshi counters that he knows well that he cannot have an Okusang, which sobers Ryu up. Seiko wonders why Ryu can’t have an Okusang. Takeshi replies that anyone can have a secondary wife, but Ryu is the type of man that once he falls in love, he is committed to that person. Seiko then wonders whether that means he has a lover. Takeshi relents that it’s not his lover, but his future fiancé. He’s falling in love with her and doesn’t realize it yet. And how would Takeshi know that, if the owner doesn’t even know it? Takeshi smiles and settles himself behind Seiko’s chair. He spins her around to face him, and goes in for a goodnight kiss. Just one kiss, he pleads. He kisses her tenderly on the cheek and goes in for the real deal, but a vision of Keniji harassing her forces him to pull back. He’s holding his end of the bargain, that they would only be roommates.. he doesn’t want to torment her more than he already has. Aw, what he doesn’t understand is that maybe after the harassment from Keniji, she may need some tenderness. Let’s not confuse manhandling with a gentleman’s caress. Takeshi takes his frustrations out on the Kendo practice with Haro, hey, couldn’t be a more perfect partner. The next morning he sees Seiko with her hair braided and smiles at her. He kneels down and unties the braid, informing her that she can do whatever hair styles she wants, in exception to braiding her hair. That’s forbidden now that she’s married. Takeshi hands her the spending allowance, which makes Seiko uncomfortable. She tells him that she cannot accept the money since she already has financial aid from her scholarship. He laments that she’s a representation of Onitsuka so she would need to have a monthly allowance and live up to her role. With that, she accepts. Ryu teases his cousin that he disappeared to help Okusang with her hair, is he afraid men would flirt with her? Heh. With an adorable (not to mention dimpled) smile, Ryu jumps into the car with his cousin, while Seiko takes off in another. I could watch these bros all day. Haro is assigned to follow Seiko to school, but upon reaching the college, everyone gives her the dirty look. He inquires on whether she wants to return home, but Seiko relents that it is fine. Seiko shares the latest development in her life with her college friend, who is shocked to hear that Aiko had sent Keniji to kidnap her. Seiko has yet to report this to Takeshi because she doesn’t want to cause any more problems. What she doesn’t know though, is that Takeshi had forewarned the Misawa that if they dare lay their hands on her, in any way shape or form (not to mention kidnapping accomplice!) then the agreement is nulled. Seiko relents that she only has a year to hold on tight until she can return to Thailand. Aiko’s rat peers at them from the bookshelves, eavesdropping. She thinks that Seiko is announcing to everyone that she has a husband now. She promises to inform Aiko of this latest development. Which isn’t the best timing for Aiko, because she just got back from the doctor (psych doctor? Wishful thinking) and the friend drops the bomb on her. Aiko promises to eradicate Seiko out of Takeshi’s life once and for all. Takeshi and Seiko rearrange the room so that they can include study tables. But Seiko thinks that she rammed the table against Takeshi’s finger, which allows some additional cute scenes. He says that he wants this doctor to evaluate his condition, why is it that his heart races every time he’s around her? Seiko chides him for tricking her, but he relents that if he doesn’t incorporate some conning, how will he know that she worries about him? To spite him, Seiko tells him that she’s not worried about him at all. Takeshi tells her not to deny her heart anymore, because he knows that she has already given it to him. He returns the Onitsuka necklace to her and pledges that his heart will be with her forever. Seiko gives him a warm smile as his words warm her heart. Aw, I cannot get enough of these two. They are so cute. I know that Seiko is forewarning her heart not to fall even more in love with Takeshi, but that’s the thing about hearts of hearts, they don’t listen and fall in love of their own volition. How many times did I want to slap the grin/smile/squeal off my face? I’ve lost count. Although I do find that the reality of Seiko being Okusang is probably the only feasible reality at this time, because Takeshi can’t renege on his father’s promise, and the only way to keep her safe is to keep her at his house, but per his culture she has to be at his house for a reason – not just a roommate. And so here we are, secondary wife. And yet, sigh. Mario is pulling out all of the stops as Takeshi. I could feel his torment over Seiko, his deep love for her. However for Seiko (Taew), I do want more from her. This is more of the writer’s side that hasn’t created Taew’s character to play a bigger role in the plot. I feel like she’s just skating through this whole story, telling herself to just MAKE IT one more year. Survive this debacle, these crazy people in Japan, one more year. She’s willing to be slapped around, kidnapped, involve herself with Takeshi, and now be his secondary wife (albeit only in name) to survive one more year. I hope that there’s a turning point for her, that she fights for the man she loves and say screw it to one more year. But dang, I love Takeshi and Ryu together. I can watch the heck out of their teasing and brotherly scenes! I know that Mayumi-Ryu only appears for about 2 minutes in this episode, but those were some 2 really good minutes. I always, just about die every time I see them. So darn CUTE. They make me giddy like a school girl. His clan, Misawa clan, and even YOU may think that Takeshi is a fool. But he’s a fool who admits that he’s selfish, that he’s head over heels with a girl, he finds ways to fight for her and uphold his honor to his family at the same time. But to me, more than anything, he’s a fool in love. And for that, I must be the silly fool who’s rooting for him all the way. Su-su Takeshi! Can this couple please just make pretty babies and live happily ever after! Their so damn adorable! Why doesn’t he want her to braid her hair? Is there a Japanese custom that says that woman after marriage can’t do that OR she looks too gorgeous with that hairstyle and he’s possessive of her and doesn’t want any guy looking at her. Since I’m complete romantic at heart I’m going to pick the latter. 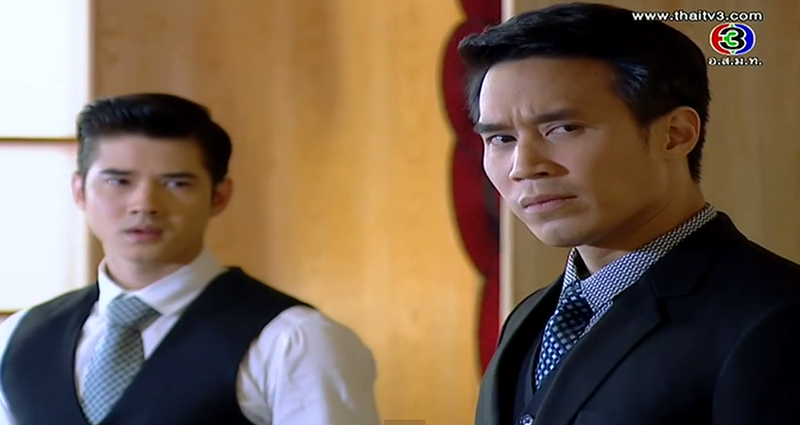 Nadech and Yaya are lighting up my screen. Their just so visually appealing to look at and the chemistry, oh lord the chemistry! Thanks again for the recap. Today eps have so many sweet scene with Takesji and Seiko. Takeshi do know how to sweet talk to Seiko. As for Ryu and Mayumi, only several min in the ep but oh how they melt my heart with their sweetness. 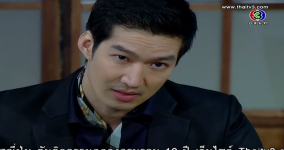 Can’t wait for tomorrow ep..
P’Fia..u were spot on with your recaps. You had me giggling again like a fool in front of the computer with your remarks. I have to say, Takeshi has the corniest line.. corniest!! And yet I’m squealing and slapping the table at the same time unable to control myself. They were so sweet together. This just keeps getting better! I’m all warm and fuzzy for now. Thanks P’fia! I think in Japanese culture, it’s not suitable for a wife to put their hair down.